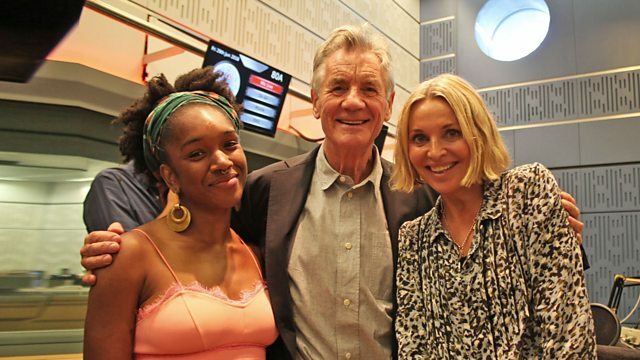 Clive Anderson and Nikki Bedi are joined by Barry Humphries, Michael Palin, Kelli O'Hara and Cherrelle Skeete for an eclectic mix of conversation, music and comedy. With music from Calypso Rose and Dinosaur. 'Barry Humphries' Weimar Cabaret' is at The Barbican, London from 11th to 29th July. 'Songs of WW3: A Tribute to Adrian Mitchell' is on 3rd July at 20.00 and is part of the Ledbury Poetry Festival which runs from 29th June to 8th July. 'Michael Palin in Conversation with Robert Ross' is at Grand Opera House, York as part of Great Yorkshire Fringe on 28th July. 'The King and I' runs until 29th September at the London Palladium. ‘So Calypso!’ is available now on Because. Calypso Rose is joining Anthony Joseph & friends for 'Windrush: A Celebration' at London's Barbican on 17th November. 'Wonder Trail' is available now on Edition Records. Dinosaur are playing North Sea Jazz Festival, Rotterdam on 13th, Little Mill Oast, Maidstone on 14th and Lescar, Sheffield on 18th July.